How many of us noticed Feb. 24, 2010? “Linked In” reports nothing much of note. The Black Eyed Peas had a concert at Madison Square Garden. Since Saudi Arabia and China established diplomatic ties, two-way trade has grown from $290 million in 1990 to more than $40 billion in 2008. Can we really count-on the Saudis to help us in the future? The Chinese have aggressively and consistently been inking long term oil supply deals from Darfur to Lima, guaranteeing Chinese oil supplies for the next decade – and news reports consistently say that the Chinese are not using the political strong-arm techniques of the British and Americans, making the deals about oil and Yuan vs. Western efforts at trade agreements that simultaneously attempt to muscle various regimes to fall-in-line behind US or British foreign policy. US Federal Govt. Deficits under Bush the Second tripled from $150 billion under Clinton up to $450 billion per year. The US deficits again tripled in Obama’s first year as President and are predicted to hit $1.7 Trillion this year. US Govt. 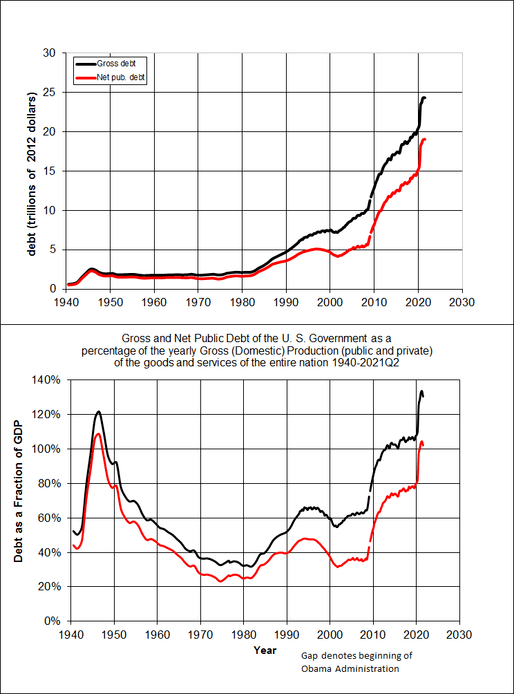 Cumulative Public Debt tripled from $3 Trillion under Clinton up to $10 Trillion under Bush & Obama. It took the US 225 years to accumulate it’s first $10 Trillion in debt, and that debt is projected to double in just the next 8-10 years. Deutsche Bank projects that of the 17 Developed Market Nations, by 2020 only 5 will be in very weak economic shape, due to their overly large public debt/GDP, with each nation’s annual interest payments exceeding any other spending item. The 5 weak economies? Greece, Portugal, Italy, Japan, and USA, all with Debt Ratios of over 131. The USA is currently at a mediocre Debt Ratio of 53, but her current large Federal deficits will put her in an equivalent status with Greece, Italy and Portugal by 2020, unless there are dramatic spending cuts or tax increases. USA’s current weak-modest rating is based on very low interest rates, which are projected to double in the next 3 years – doubling the US’s interest payments on her debts vs Mexico and China which have relatively small debts and small annual Govt. deficits. Mexico has excellent Debt Ratio ratings both now and in 2020 of < 20. China has intermediate ratings between 20 and 52.2. The US Govt. seems to have no consistent energy program for the future and is being rapidly displaced by China’s focused and effective efforts. As the world economies recover from the 2008 financial crisis and oil consumption surpasses oil production capacity, and as China’s and India’s oil consumption jump by 7% – 10%, demand for oil will soon exceed supply, and we predict oil that prices will likely rise this coming year to $120 – $150 per barrel. As the US dollar loses value vs. other currencies due to huge Federal deficits, oil prices in US dollars would increase due to decreases in US dollar value – raising prices on all consumer goods in the USA. Which countries appear to be managing their economic problems and the future well, and which countries seem to react to the latest headlines? Are you a planner, do you simply react to the latest crisis, or do you ignore it all and hope it just goes away, or maybe we’ll just muddle through? Invest in a mid-level risk oil production company like Statoil ASA (NYSE ADR: STO). Statoil is a Norway-based energy company with operations in about 40 countries around the world. Statoil had proven reserves of 2.17 billion barrels of oil and 18.1 trillion cubic feet of natural gas (http://www.norway.org/ARCHIVE/business/businessnews/statoildiscoversoil/); their profits have tripled with their typical contract price of just $74 per barrel prices, (http://www.bloomberg.com/apps/news?pid=20601087&sid=aurAJ.2VH3Ek&pos=6); and their sales, earnings growth, debt and other metrics look solid. Invest in a higher risk but potentially higher return operation like PetroBras (Petroleo Brasileiro) and their absolutely huge deep water off-shore reserves. As oil prices go above $100 a barrel, it will make a lot of new oil production possible, especially in areas where $60 – $80 per barrel oil would not support drilling costs. These new wells and some rehabilitated old wells will increase world capacity, but it typically takes 8-10 years to bring new wells on-line. or Maybe invest in Mexico? Buy property? Buy Pesos? At least Mexico has enough oil to export to support 40% of Mexican Govt. spending, and as oil prices increase, Mexico’s profits from oil exports should rise dramatically. More later on why Mexico’s Peso future appears brighter the the US Dollar – from Yucalandia’s perspectives – unless economic crises affecting the USA also drag down Mexico.